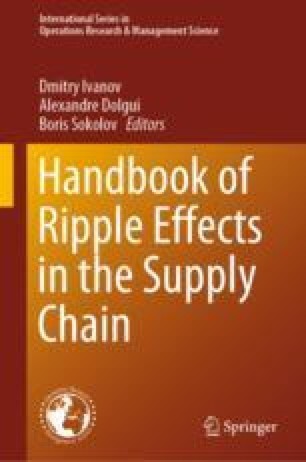 In the supply chain (SC) recovery process, a disruptive event, planning of the recovery control policy and implementation of this policy are distributed in time and subject to SC structural and parametrical dynamics. In other words, environment, SC structure and its operational parameters may change in the period between the planning of the recovery control policy and its implementation. As such, situational proactive control with combined use of simulation-optimization and analytics is proposed in the paper to improve processes of transition between a disrupted and a restored SC state. Implementation of situational proactive control can reduce investments in robustness and increase resilience by obviating the time traps in transition process control problems. This chapter develops a model of a decision support system for situational proactive control of SC recovery processes based on a combination of optimization and analytics techniques. More specifically, three dynamic models are developed and integrated with each other, i.e. a model of SC material flow control, a model of SC recovery control and a model of SC recovery control adjustment. The given models are developed within a cyber-physical SC framework based on the service modularization approach. DHL (2018). Retrived February 4, 2018, from https://resilience360.com/. He, J., Alavifard, F., Ivanov, D., & Jahani, H. (2018). A real-option approach to mitigate disruption risk in the supply chain. Omega. https://doi.org/10.1016/j.omega.2018.08.008. Panetto H., Iung B., Ivanov D., Weichhart G., Wang X. (2019). Challenges for the cyber-physical manufacturing enterprises of the future. Annual Reviews in Control. https://doi.org/10.1016/j.arcontrol.2019.02.002. Pavlov, A., Ivanov, D., Pavlov, D., & Slinko, A. (2019). Optimization of network redundancy and contingency planning in sustainable and resilient supply chain resource management under conditions of structural dynamics. Annals of Operations Research. https://doi.org/10.1007/s10479-019-03182-6. RM. (2018). Retrieved February 10, 2018, from https://www.riskmethods.net/en/software/overview. UPS (2018). Retrieved February 11, 2018, from https://www.youtube.com/watch?v=aYoNd2nQqLg. Wilkinson G. (2018). Integrating artificial intelligence with simulation modeling. Retrieved February 11, 2018, from https://www.anylogic.com/blog/.